We offer mechanical and electrical, preventative and reactive service, maintenance and repair for a wide variety of building services equipment, whether or not this has been supplied by Colt. 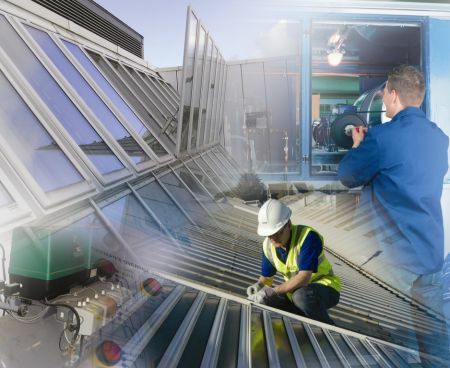 Our specialities are smoke control and fire protection systems, ventilation and shading equipment and their associated controls and ancillaries. Service means providing you with a tailored maintenance regime to ensure optimum product performance, whilst ensuring that national and local legislative obligations are met. In the event of equipment malfunction, service means a fast and efficient call-out and repair process. Programmed preventative maintenance. We will work to ensure that your equipment is in optimum running order. Repair and refurbishment of existing systems regardless of who is the manufacturer. Design support to you to optimize the performance of your installed equipment, should alterations to the building fabric or function be necessary. We maintain a detailed database of equipment as well as details of failure modes going back many years, which enables us to best plan building services maintenance schedules. We understand the importance of providing a responsive and communicative customer service, which is the key to be able to deliver the quality service required by our customers. Our network of directly employed service personnel and authorised Colt trained specialist contractors ensures that we deliver a specialist and prompt service to our customers. Our service teams offer a fast response, round the clock service to supporting both our own and other manufacturers' products. We ensure quick delivery of spare parts, with many from our own stocks. Our Service Engineers and authorised contractors are located throughout Singapore enabling a prompt and cost effective response in an emergency. We respond flexibly to meet the needs and demands of your business. We have developed detailed service specifications for all equipment maintained, to ensure that the work is carried out to highest standards. Our Service Engineers and authorised contractors have many years of experience in these specialised systems. Our policy is where possible to assign the same Service Engineer for every visit. This ensures continuity of service and knowledge of the site and equipment. Programmed preventative maintenance can extend the life of an item, and reduce the likelihood of down-time. Such a programme also may permit the equipment to be updated in line with the latest technological advances and standards. For life safety equipment such as smoke control systems, the building operator or owner is required by law to provide a suitable system of maintenance to maintain the system in efficient working order and in good repair.